"working collaboratively with other institutions having similar purposes, including those forming part of the international library community." The library supports schools through its Services to Schools business unit, which has curriculum and advisory branches around New Zealand. The Legal Deposit Office is New Zealand's agency for ISBN and ISSN. 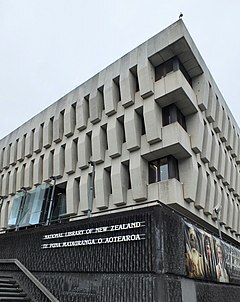 The library headquarters is close to the Parliament of New Zealand and the Court of Appeal on the corner of Aitken and Molesworth Streets, Wellington. 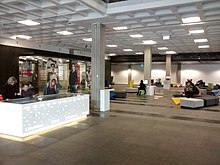 The National Library of New Zealand was formed in 1965 when the Alexander Turnbull Library, the General Assembly Library, and the National Library Service were brought together by the National Library Act (1965). In 1980, the Archive of New Zealand Music was established at the suggestion of New Zealand composer Douglas Lilburn. In 1985, the General Assembly Library separated from the National Library and is now known as The Parliamentary Library. Staff and collections from 14 different sites around Wellington were centralised in a new National Library building, officially opened in August 1987. The architecture of the building is said to have been heavily influenced by design of the Boston City Hall., but direct reference to the Birmingham Central Library should not be ruled out. In 1988, the National Library became an autonomous government department where previously it had been administered by the Department of Education. The same year, the Library took on the Maori name Te Puna Mātauranga o Aotearoa, which translated means: the wellspring of knowledge, of New Zealand. In early 1998 an ambitious $8.5 million computer project was scrapped. The National Library building was to be expanded and upgraded in 2009–2011, but the incoming government greatly scaled down the scope of the work, reducing the budget for it and delaying the commencement, arguing concerns about the cost of the project and the reduction in the accessibility of collections and facilities during the construction work. The building closed for two years, reopening in June 2012, while refurbishment continued. On 25 March 2010 the Minister of State Services announced that Archives New Zealand and the National Library of New Zealand would be merged into the Department of Internal Affairs. In June 2018 a National Archival and Library Institutions Ministerial Group (NALI) was announced. The purpose of NALI was to examine the structure and role of the National Library, Archives New Zealand and Ngā Taonga Sound & Vision, the position of the Chief Archivist and National Librarian, and the future of collecting, preserving and providing access to New Zealand's documentary heritage, particularly digital preservation and access. Before and since NALI was set up concern has been expressed about the National Library being part of the Department of Internal Affairs. Women's Suffrage Petition (Te Petihana Whakamana Pōti Wahine). The documents were moved from Archives New Zealand on 22 April 2017 under tight security. The National Library's collections are stored in the main building in Wellington and several other cities in New Zealand. The library has three main groups: the General Collections, the Schools Collection, and the collections of the Alexander Turnbull Library. Access to many collections is provided through digital products and online resources. The General Collections focus on supporting the information needs of New Zealanders through services to individuals, schools and researchers, with notable collections such as the Dorothy Neal White Collection. The Schools Collection contains books and other material to support teaching and learning in New Zealand schools. Turnbull collected the works of John Milton extensively, and the library now has holdings of Milton's works which are "ranked among the finest in the world" and "good collections of seventeenth-century poetical miscellanies and of Dryden material, ... along with fine sets of literary periodicals." The Friends of the Turnbull Library (FoTL) is an incorporated society that supports the work of the Alexander Turnbull Library by organising events, activities and offering an annual research grant to a scholars using the library’s resources. FoTL also funds the publication of the Turnbull Library Record which publishes information about the activities of the library and showcases the Library’s collections. First published in 1940, digital issues of The Turnbull Library Record are available through Papers Past. The unpublished material held by the Turnbull Library can be searched in Tiaki. School libraries can keep up-to-date with research on school libraries, and gain advice on management, finance and staffing, collection management, library systems, and teaching and learning. Reading engagement encompasses advice on supporting children's reading and children's and young adults literature. Digital literacy supports the school library's role in developing digital literacy and inquiry learning. Professional and Learning Support for school librarians and educators via courses, events and online methods. Established in 2004, the National Digital Heritage Archive is a partnership between the National Library, Ex Libris and Sun Microsystems to develop a digital archive and preservation management system. A digital storehouse, the system ensures that websites, digital images, CDs, DVDs and other 'digitally born' and digitised items that make up the Library's growing digital heritage collections will, despite technical obsolescence, be preserved and remain accessible to researchers, students and library users now and in the future. The Papers Past website, run by the National Library of New Zealand, provides free access to digitised newspapers, magazines, journals, letters, diaries, and parliamentary papers from the 19th and 20th centuries. It was launched in 2001. Index New Zealand (INNZ) is a free database of articles from journals, magazines and newspapers covering New Zealand and the South Pacific. ^ Catherall, Sarah (22 August 2009). "National Library: Bookworm heaven vs wow factor". The Dominion Post. p. D2. ^ "Our history | About the Library | National Library of New Zealand". natlib.govt.nz. Retrieved 8 December 2017. ^ Gifford, Adam (19 January 1999). "Library systems miss out on NZ technology". The New Zealand Herald. Retrieved 27 October 2011. ^ "$69m plan to extend National Library". Stuff. 26 May 2008. ^ "Concern over plans for National Library". The Dominion Post. 10 February 2009. Archived from the original on 10 September 2012. ^ Hunt, Tom (6 August 2012). "National Library re-opens to researchers". The Dominion Post. Fairfax NZ News. Retrieved 21 October 2012. ^ "National Archival and Library Institutions Ministerial Group - dia.govt.nz". www.dia.govt.nz. Retrieved 2 March 2019. ^ Gilling, Don (26 February 2019). "What's needed for the National Library, Turnbull and Archives". Wellington.Scoop. Retrieved 2 March 2019. ^ "Treaty of Waitangi moved to new Wellington home under cover of darkness". The Dominion Post. 22 April 2017. Retrieved 19 February 2019. ^ "National Library of New Zealand (Te Puna Mātauranga o Aotearoa) Act 2003". New Zealand Legislation. Parliamentary Counsel Office. Retrieved 11 March 2019. ^ "Historic Wellington buildings transfer" (Press release). New Zealand Department of Conservation. 29 June 2017. Retrieved 7 December 2017. ^ "Purposes of Alexander Turnbull Library". New Zealand Legislation. Parliamentary Counsel Office. Retrieved 11 March 2019. ^ "Turnbull, Alexander Horsburgh". An Encyclopaedia of New Zealand. Edited by A.H. McLintock, originally published in 1966. ^ Oliver, Fiona (4 September 2018). "The Turnbull Library Record: Past and Future". natlib.govt.nz. Retrieved 18 February 2019. ^ "Our work". National Library Services to Schools. Retrieved 28 February 2019. ^ Buchan, Jo (March 2018). "National Library's Services to Schools helping to create readers". Library Life. 465: 26. ^ a b "Services to Schools". National Library Services to Schools. Retrieved 28 February 2019. ^ "National Digital Heritage Archive". National Library of New Zealand. Archived from the original on 23 May 2012. Retrieved 21 October 2012. ^ "About Papers Past". Papers Past. National Library of New Zealand. Retrieved 9 July 2017. ^ "Index New Zealand indexes" (PDF). National Library. October 2018. Retrieved 28 February 2019. 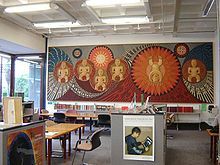 Wikimedia Commons has media related to National Library of New Zealand.